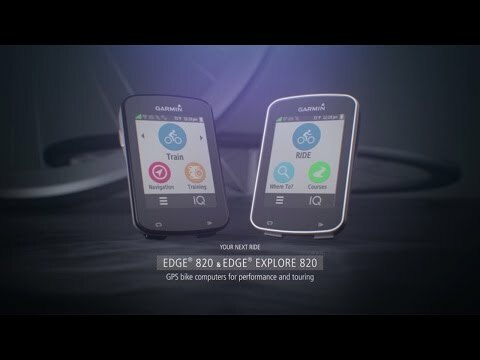 Garmin took the training features that made the Edge 520 a favourite, added the cycling-specific navigation functions from the Edge 1000, and created the compact Edge 820. The 820 has improved social training functions, keeping full Strava segment integration and adding a new GroupTrack feature that displays exact location and speed information for your fellow riders. With ANT+, Bluetooth and wifi sensors, the potential for next level riding is huge; train smarter with power meters, cadence sensors, heartrate monitors, ride safer with Garmin’s Varia radar and lighting units, or even take your bike one step closer to a smart bike with electronic shifter integration. Whether training for your next race, planning your next cycle tour, or just riding with friends, the Edge 820 has something for every riding style. Newly designed touch-based interface is intuitive and easy to use, allowing fast access to activity profiles, training metrics, and Connect IQ apps. Navigate the best cycling roads with preloaded maps and points of interest (POIs). Round-trip routing makes it easy to explore new roads, and Route Planner allows you to create routes using the map or POIs. Strava Segment integration lets you know when your starred segment is about to begin and shows instantaneous data, not just of your performance in the moment, but also how it compares to your PR and the current KOM or QOM, and then provides results once the segment is complete. Incident detection uses accelerometers to detect if an accident has occurred. In the case of an accident the unit sends a signal through your paired smartphone to predefined emergency contacts, letting them know where you are and that you need help. Large, glove-friendly touchscreen adjusts automatically for low-light areas. Includes a standard handlebar mount and a space-saving out-front mount. Free Garmin software updates add features and connectivity with other products such as, electronic shifters, ANT+ enabled lights, and social platforms like Strava.